Now to the front. We’re finally happy with the fitting of the hood. Take a look at the pics and you will see it’s fitting really nice! finally! We’ve got most of the PIAA lights installed in the front and most are fitting nice, but take a look at the pictures with the lower valance off.. you can see the lower fog lights are not in line with each other.. this is to show you how out of whack these kits are! With the kit on they ‘look’ in line… but this is only because of the modifications that had to be done underneath. Everything seems to be going smoothly now. Our only hitches at the moment are the side exhaust tips. It seems with this Australian kit the holes for the tips don’t drop down as far as the American kits, so my Aeroform tips are coming out too low. So we’re going to have to cut these tips up! 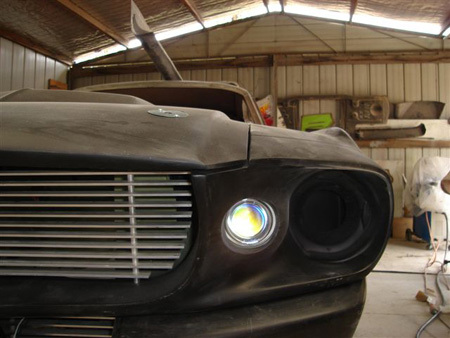 The second problem is the front headlights. Which are finally being shipped this week from the US, but more on that later. For now enjoy these. photos. Man can i buy that from you when you are done with it i already have a 1970 Chevy Chevelle, 1964 Chevy Impala SS, and a brand new 2008 Dodge Viper dude its fast. But i really want a 1967 Ford Mustang Gt 500. I can spare $70,000. I suggest looking for a standard 1967 or 68 Fastback in Australia. Try ebay, i’ve seen a few on there. I got mine from the states which landed in Australia cost about 20k and it was rust free in good condition. Make sure you have someone in the know look it over before you buy it as there can be lots of hidden problems. An Eleanor project is not cheap, so make sure you’re settled in for a long, expensive few years! Being in the states helps a lot. just search ebay for a 1967 fastback and make sure you do your homework on it. I think you guys have things called Titles? we don’t have them here but i think you need to ensure it’s clear or free or something? 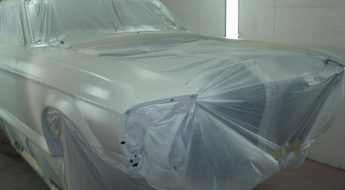 Check for rust, also if ther car has had any prior accidents, all this can be hidden. i suggest going to this forum and asking the guys there for info.. most are in the states and would help you so much. The forum helped me a great deal. As for price, well you can go mild or wild, you can really spend any amount. so i can’t say really. But you’re young, if yu start early and stick with it then you will get there. i was around the same age when i started mine. it’s been long but it’s slowely coming together. 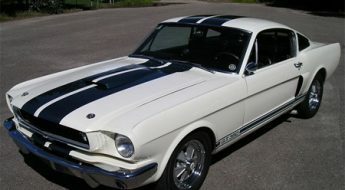 How can i buy mustang gt500 1967 body in the picture ???????? can someone help me !!!!!!! please ???? ?